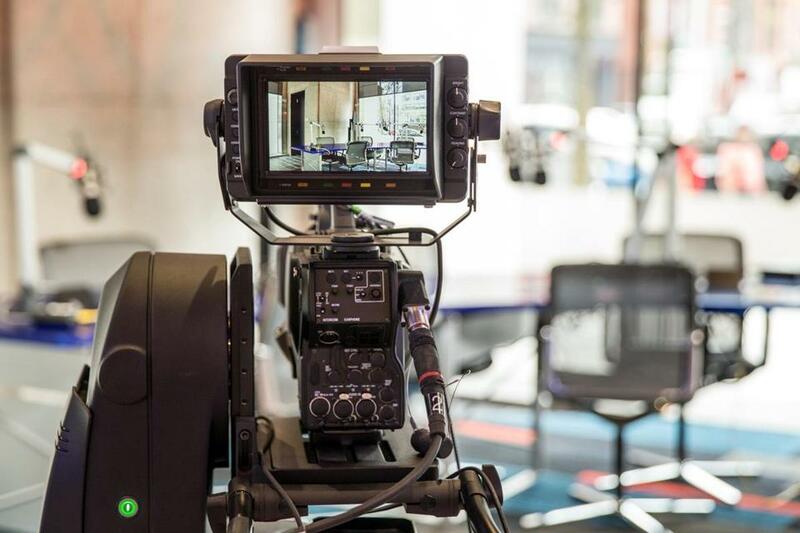 WGBH’s satellite studio at Boston Public Library, which opens Friday, will include three cameras, along with a news desk and production room. The library of tomorrow will be here Friday. Boston Public Library is getting ready to debut its unique cafe-within-a-television/radio-studio-within-a-library, as part of its campaign to be a more welcoming, less stuffy community space. You won’t see any “No Talking Please” or “No Food or Drink Allowed” signs here. Greeting visitors immediately to the right of the Boylston Street entrance of the Johnson Building in the Back Bay will be a new satellite studio for public broadcaster WGBH and a 60-seat Newsfeed Cafe operated by The Catered Affair. Both are among the final pieces to the library’s ambitious three-year, $78 million renovations. “What could possibly be better than putting books, news, and coffee together,” BPL president David Leonard said during a recent tour. Benjamin Godley, chief operating officer for WGBH, was at the new studio at the Boston Public Library. 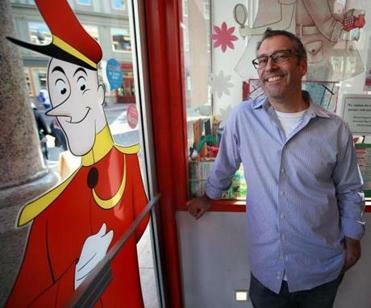 Adam Hirsch lost his bid to open a second Curious George Store in a new retail space at the Boston Public Library. Floor-to-ceiling glass panes are meant to be inviting and to encourage pedestrians to peer inside, in contrast to the previous dark windows and granite pillars that made the venerable institution feel more like a fortress. Friday’s opening will kick off at 11 a.m. with the live broadcast of WGBH’s “Boston Public Radio,” slated to feature Mayor Martin J. Walsh as the program’s first guest in its new home. For WGBH, the highly visible space will bring it closer to the public, said Benjamin Godley, the station’s chief operating officer. 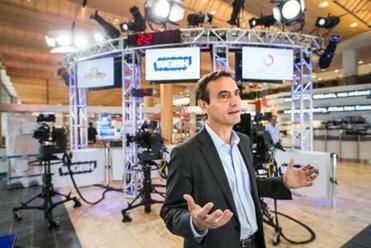 The studio occupies 1,000 square feet and features three television cameras, a news desk with radio microphones, three news tickers, a small production room, and nine video monitors that can display anything from live WGBH broadcasts to Twitter feeds. All the equipment, including the cameras, will be controlled remotely from the Brighton studio. WGBH also installed two touch-screen kiosks equipped with built-in cameras where station staff will pose daily questions to the public and record their answers for use on “Boston Public Radio” or other programs, said Linda Polach, executive managing editor of WGBH News. The station is still working out which shows will eventually broadcast from the satellite studio, but among them could be the “Under the Radar” program hosted by Callie Crossley, some podcasts, and possibly even auditions for “Sing That Thing!”, the station’s amateur group competition, Godley said. News tickers will frame the Newsfeed Cafe. Both WGBH and The Catered Affair, which partnered on their bid for the space, have five-year leases, with the option to renew for another five years. 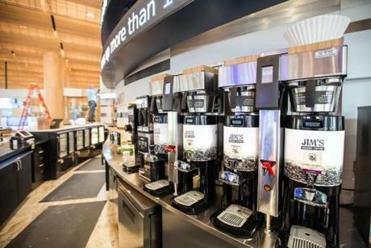 WGBH will pay $50,000 a year, while the cafe’s rent is $84,000 a year, company executives said. The Newsfeed Cafe will feature coffee, teas, as well as breakfast sandwiches, and other light fare. It will be open seven days a week in tandem with regular library hours and has space for the library to sell merchandise and souvenirs. Friday’s live broadcast will be followed at 2 p.m. by a ceremony featuring a 750-piece cake replica of the library’s Johnson and McKim buildings. On Saturday, WGBH will host the 20th anniversary party of popular children’s TV series “Arthur” at the library from 10 a.m. to 2 p.m.